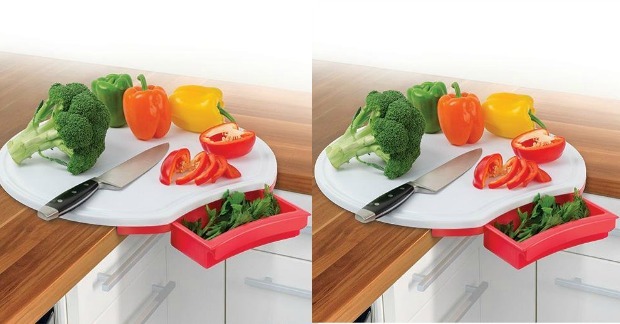 Corner Cutting Board Just $19.99! You are here: Home / Great Deals / Amazon Deals / Corner Cutting Board Just $19.99! I LOVE this idea! This Corner Cutting Board is just $19.99! It comes with a red or green drawer! This would be perfect for a small kitchen. It clips on the your counter so it doesn’t move. Easily securing to your countertop’s 90 degree corner angle, this ingenious corner cutting board extends your workspace–making it great for small kitchens! Plastic cutting board’s efficient design features a grooved perimeter well to catch juices and liquids, plus built-in drawer to collect scraps for easy removal. Large 18″ dia. cutting surface is great for prepping salads, slicing bread, carving roasts and more. In durable plastic; hand wash.